Definition at line 314 of file mysqlpl.h. Definition at line 323 of file mysqlpl.h. References _data_type, _decimals, _flags, and _width. Definition at line 366 of file mysqlpl.cpp. References _data_type, _decimals, _flags, _width, MYSQL_TYPE_BLOB, MYSQL_TYPE_DATE, MYSQL_TYPE_DATETIME, MYSQL_TYPE_DECIMAL, MYSQL_TYPE_DOUBLE, MYSQL_TYPE_FLOAT, MYSQL_TYPE_LONG, MYSQL_TYPE_LONG_BLOB, MYSQL_TYPE_LONGLONG, MYSQL_TYPE_MEDIUM_BLOB, MYSQL_TYPE_SHORT, MYSQL_TYPE_STRING, MYSQL_TYPE_TIME, MYSQL_TYPE_TINY, MYSQL_TYPE_TINY_BLOB, MYSQL_TYPE_VAR_STRING, and MYSQL_TYPE_YEAR. 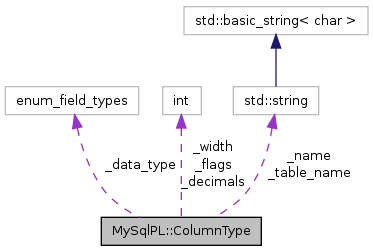 Definition at line 795 of file mysqlpl.cpp. References _data_type, _decimals, _flags, _name, _table_name, and _width. Definition at line 318 of file mysqlpl.h. Referenced by ColumnType(), get_type_str(), and init(). Definition at line 320 of file mysqlpl.h. Definition at line 321 of file mysqlpl.h. Definition at line 317 of file mysqlpl.h. Referenced by init(), MySqlPL::SqlRecord::print_columns(), and MySqlPL::SqlRecord::print_values(). Definition at line 316 of file mysqlpl.h. Referenced by init(), and MySqlPL::SqlRecord::print_columns(). Definition at line 319 of file mysqlpl.h.